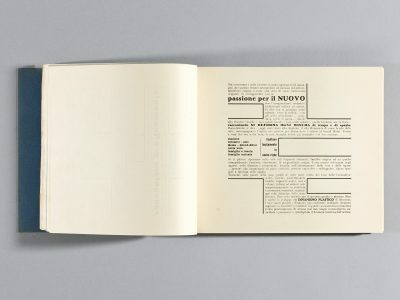 The following page by page annotation of The Bolted Book was edited by Russell Fernandez with assistance from Raffaele Bedarida, and relies heavily on original research done by Gianluca Camillini. 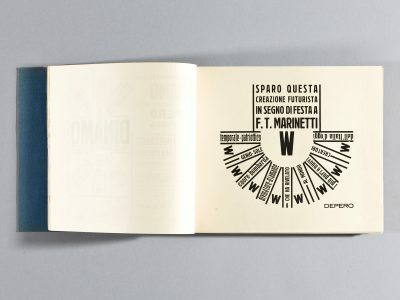 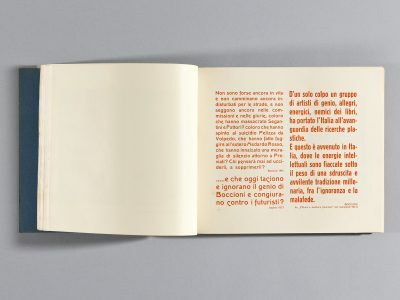 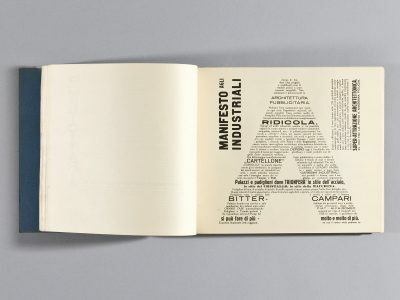 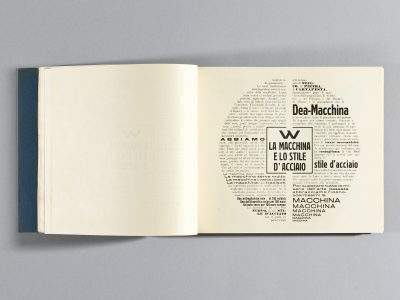 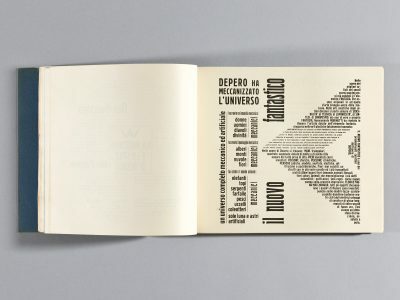 Depero dedicates his book to Futurism’s founder: “I set off this futurist creation as a sign of celebration for F. T. Marinetti.” The letter W in the center of the composition is an Italian abbreviation of the words “long live” as in “Long live Marinetti.” It appears on numerous pages throughout Depero Futurista. 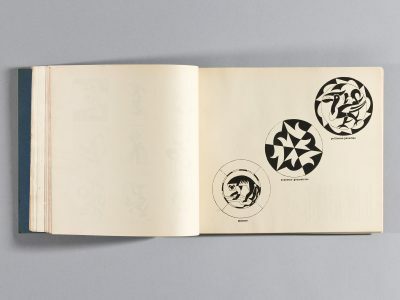 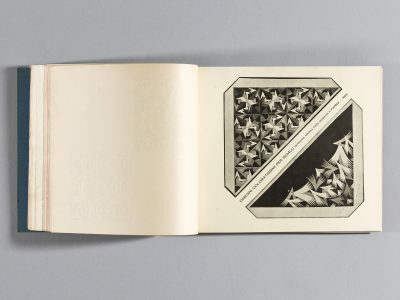 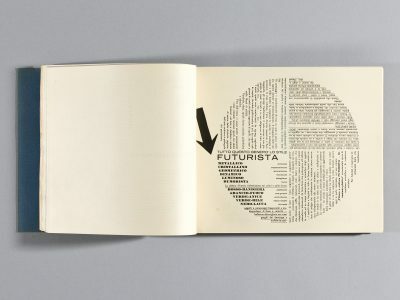 The left side of this page spread dedicated to the Futurist movement and its “engine” F.T. 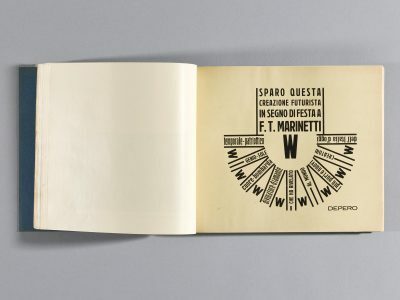 Marinetti. 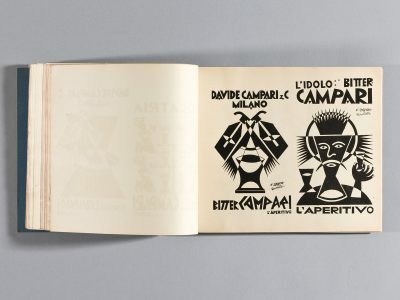 Depero makes clever use of Marinetti’s first and last initials, which he has enlarged, rotated, and placed at the center of the composition. 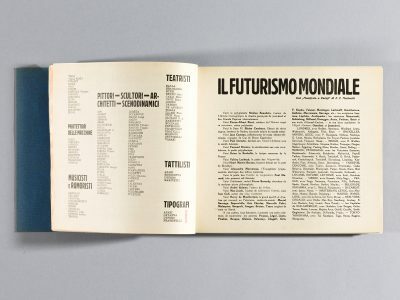 The page on the right is the first of two pages listing all known Futurist artists active in 1927, the year Depero Futurista was published. 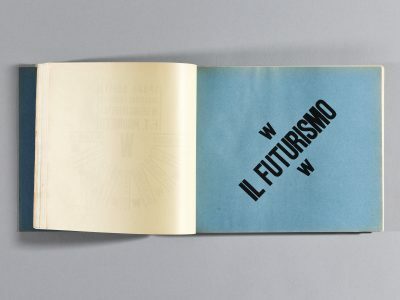 It urges “Futurists from all over the world” to contact the headquarters in Rome in order to be officially affiliated. 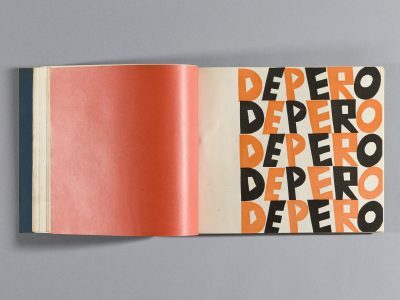 We must not remain solely contemplative. 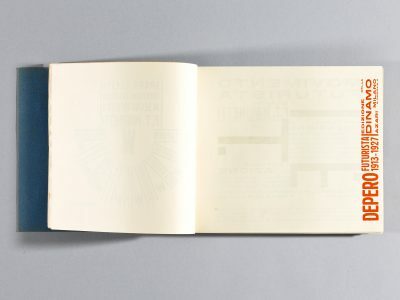 We must not simply exploit our cultural heritage. 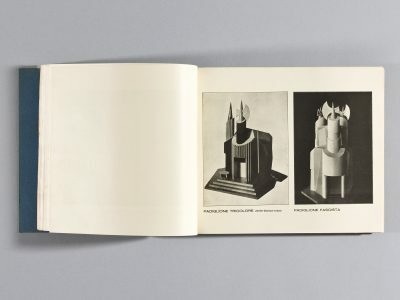 We must create a new heritage to place alongside that of antiquity. 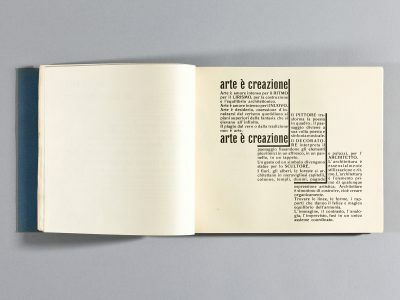 We must create a new art, an art of our times. 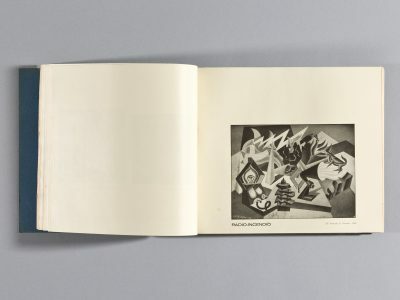 Appearing on the page that precedes a black-and-white portrait of Depero is a brief autobiographical statement summarizing the major events in the artist’s life as well as his longtime dedication to the Futurist movement. 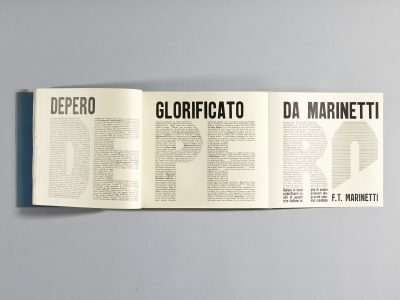 This typographical composition trumpets Depero’s multifaceted talents as a “world renowned” architect, painter, sculptor, and decorator. 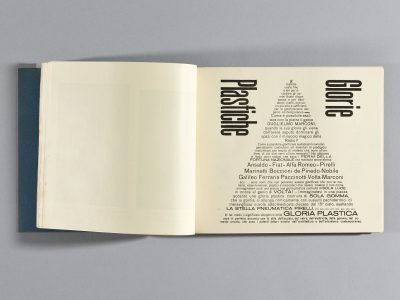 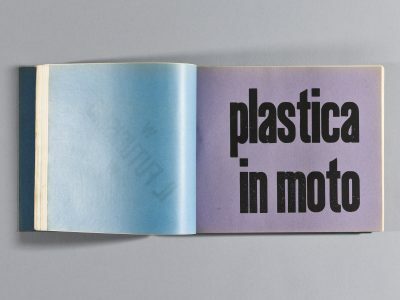 Designed to be read by rotating the page, this wall manifesto describes the Futurist approach to sculpture and the other plastic arts. 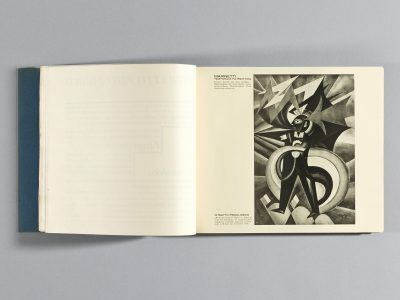 Depero also celebrates Futurism as the culmination of the previous two movements, Impressionism and Cubism. 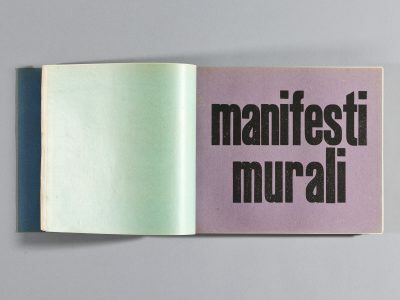 This wall manifesto is an open letter to the Italian Minister of Education about the importance of visual literacy and of encouraging children to express themselves visually in all spontaneity and freedom. 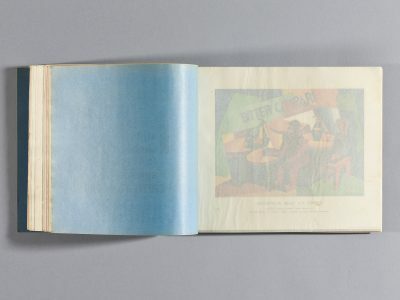 Exhibitions of this kind of children’s art would benefit the entire society. 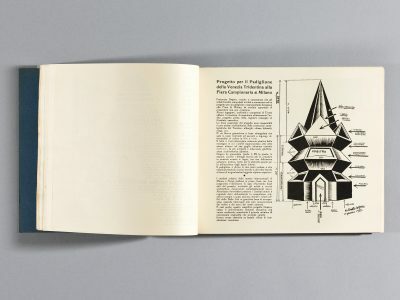 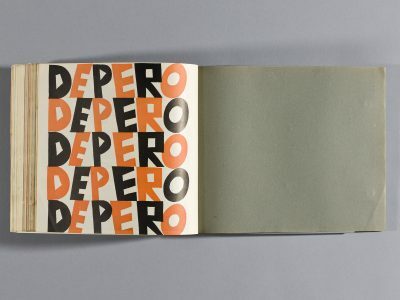 This page opens a ten-page section devoted to Depero’s architectural work. 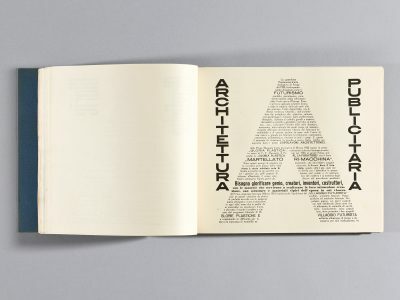 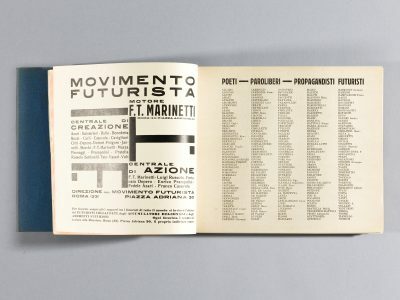 The text that forms the bridge is made bold for emphasis: “It is necessary to glorify genius, creators, inventors, constructors with the materials required to make their miraculous creations, with structures and materials typical of the era in which they lived.” In the final part of this manifesto, Depero introduces the idea of a Futurist Village, a project that he tried (unsuccessfully) to achieve in the outskirts of New York. 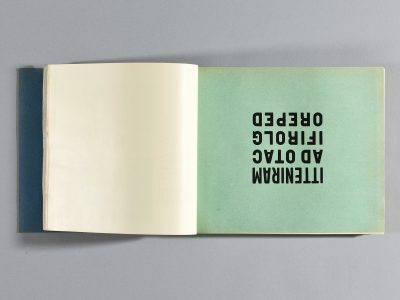 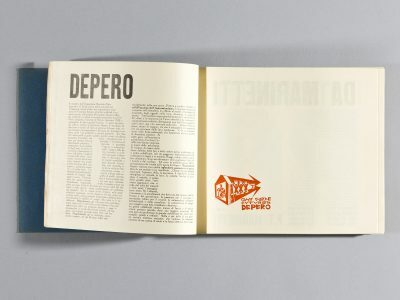 This manifesto introduces key concepts that Depero would later develop in the manifesto of Futurist advertisement that he published in 1932. 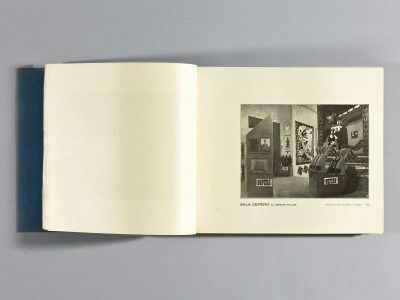 In particular he focuses on new forms of patronage in the era of industry and treats industrialists as the new patrons of the arts. 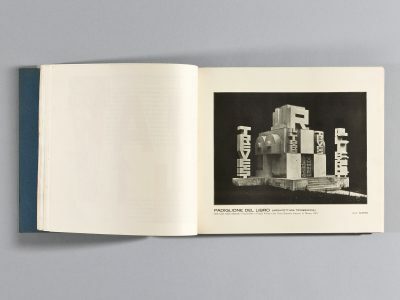 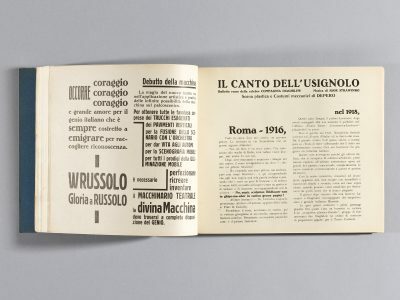 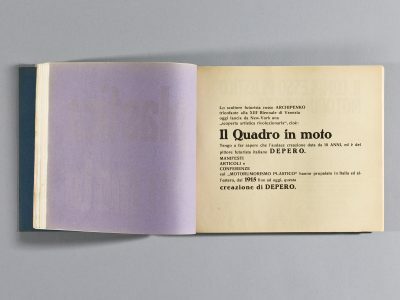 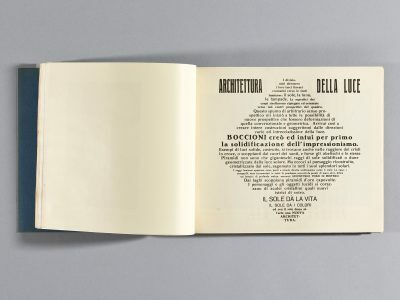 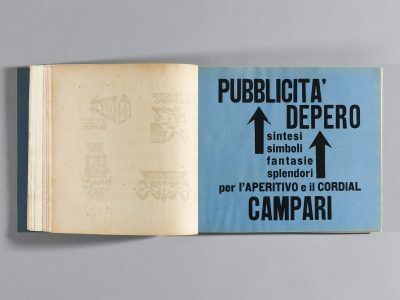 Depero presents his ideas about the fusion of architecture and advertising, including an account of how those ideas were realized in the design and construction of the Book Pavilion (Padiglione del Libro) at the 1927 International Exhibition of Decorative Arts in Monza. 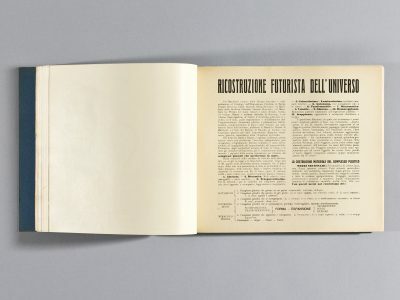 The Bestetti, Tumminelli, and Treves book pavilion at the 1927 International Exhibition of Decorative Arts in Monza. 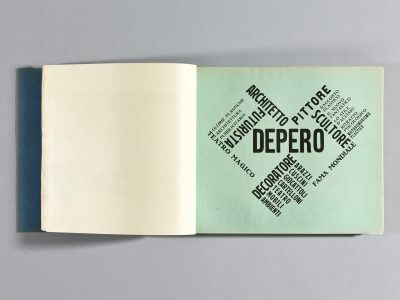 By designing the pavilion for a publishing house made out of three-dimensional letters, Depero exemplified his idea of “advertising architecture,” which is able to promote its activity through architectural shapes. 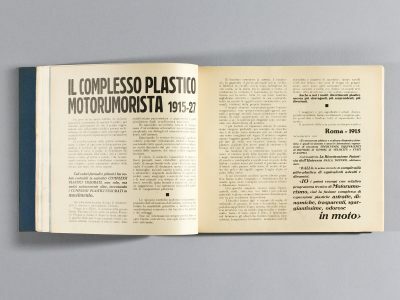 This page spread is devoted to Depero’s motorumorist plastic complexes (complessi plastici motorumorista). 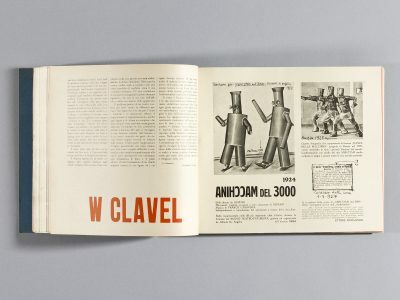 Described as “living artificial beings,” these sculptural objects were made out of metal, glass, cardboard, and other everyday materials to which Depero added a mechanism that created sound and movement. 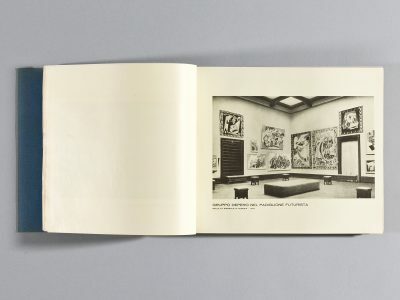 An annotated photo of one of these works appears on the right page of the spread. 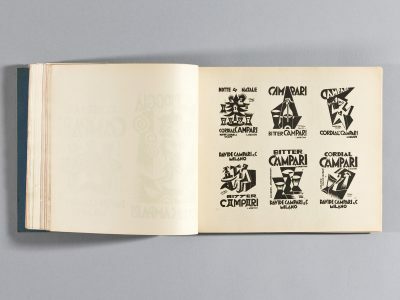 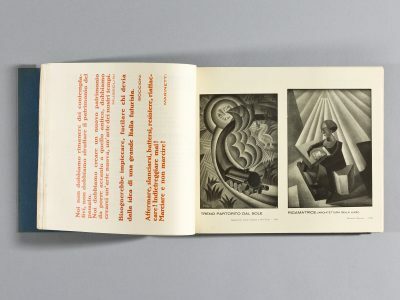 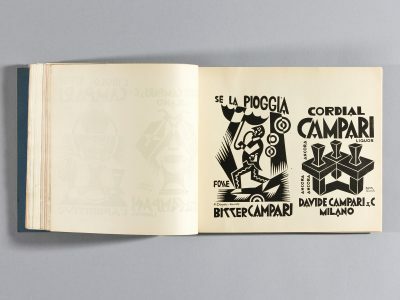 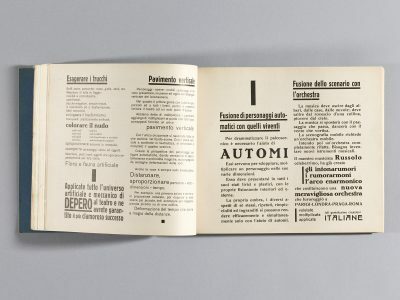 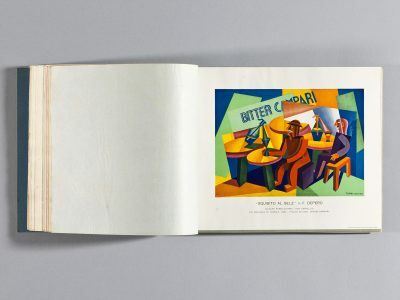 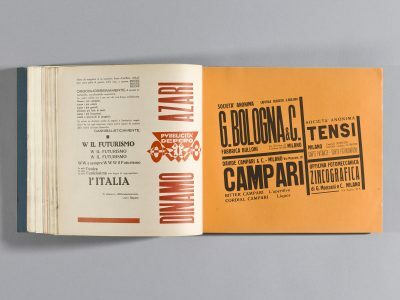 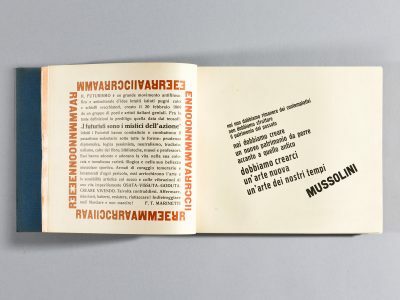 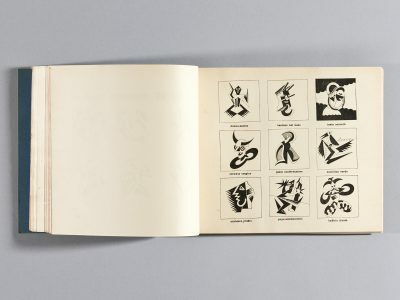 Signed in 1915 by Fortunato Depero and artist Giacomo Balla, this manifesto is considered one of the most important milestones in the formation of the Futurist aesthetic. 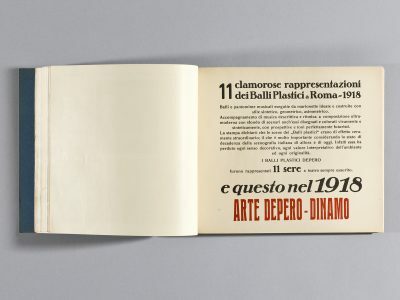 Balla had signed the founding manifestos of the previous years; the younger Depero became a leading figure in Futurism with this manifesto. 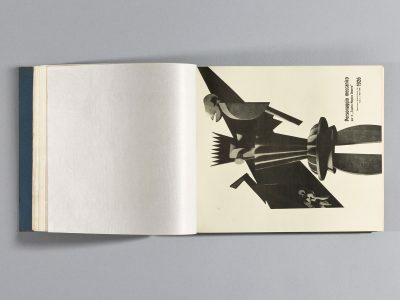 An image of a mechanical character from Depero's “Magic Theater” is visible through the tissue paper on the right side of the spread. 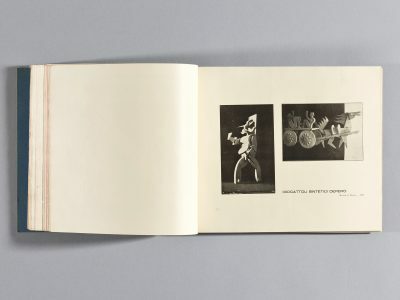 In 1916 Depero received a commission for the scenography and costumes for this “mechanical ballet,” which was ultimately canceled and given to Matisse. 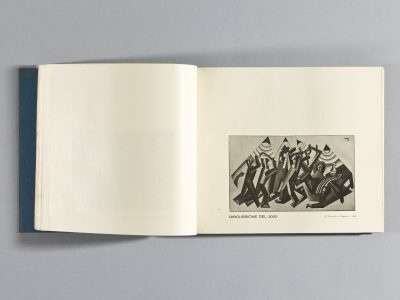 Depero documents the work here because it was both important in the development of his art and it anticipated ideas of mechanical dancing that became very popular throughout Europe in the 1920s. 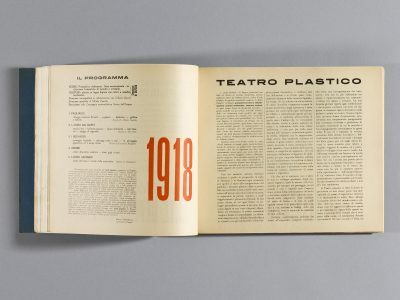 He also compares this 1924 project to a ballet made in Russia three years later. 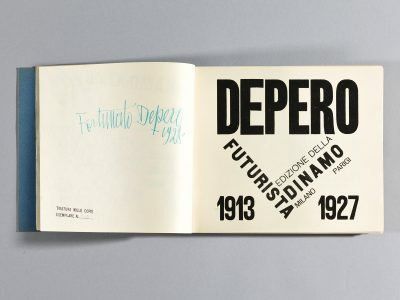 Here, like in many other parts of the book, Depero presents himself as the anticipator of many trends. 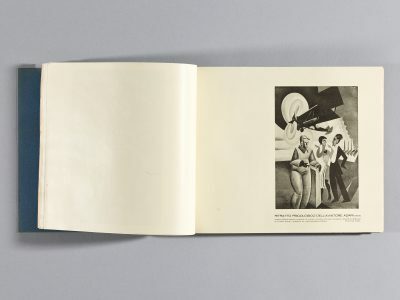 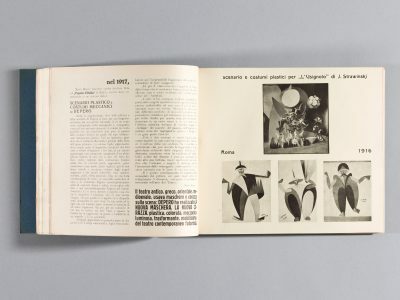 This page features a press release for a “mechanical ballet” that featured stage sets and costumes designed by Depero. Anihccam is the Italian word for machine spelled backward. 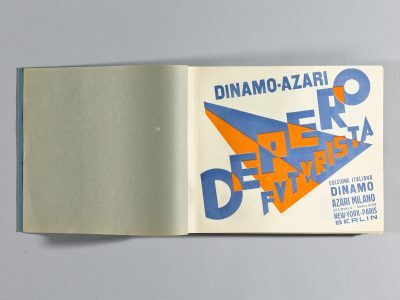 One of the half dozen Case d’arte organized by Futurist artists throughout Italy, Depero’s Futurist House was founded in 1919 in the aftermath of World War I in Rovereto, which had been partly destroyed by the war. 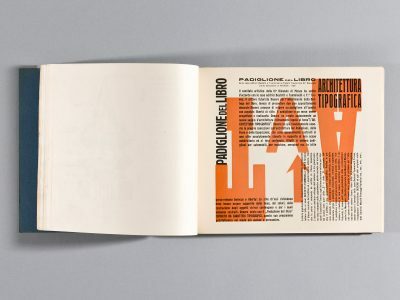 Like the Bauhaus (founded in the same year), it was part of the postwar reconstruction ideology, which emphasized the collective and artisanal dimension of artistic production as opposed to the romantic tradition of the artist alone in the studio. 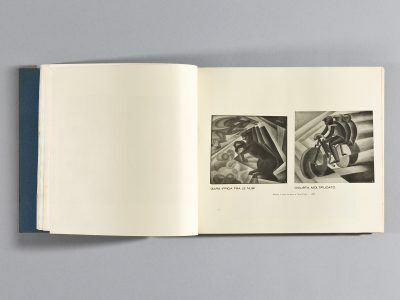 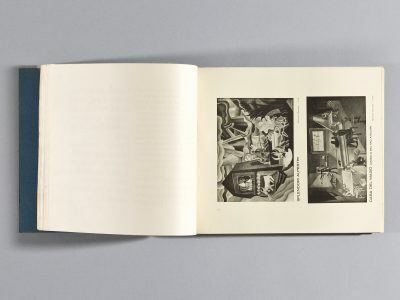 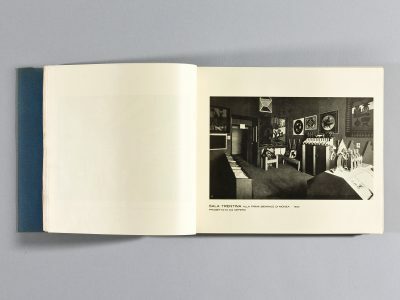 The page on the right features a photograph taken at Depero’s Futurist House of Art in Rovereto, Italy. 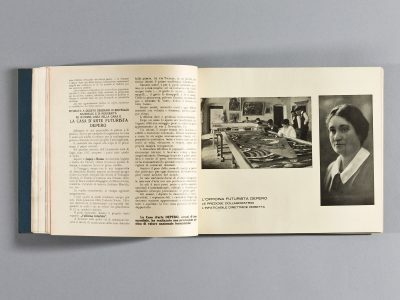 Opened in 1919, it was staffed by a team of female artisans who made a wide variety of craft products, including toys, furniture, textiles, and other decorative objects. 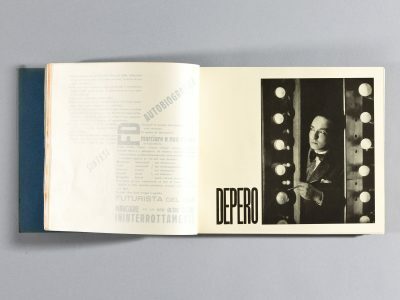 The captions read: “Depero’s Futurist Workshop: The precious collaborators” and “The tireless director Rosetta” (Depero’s wife). 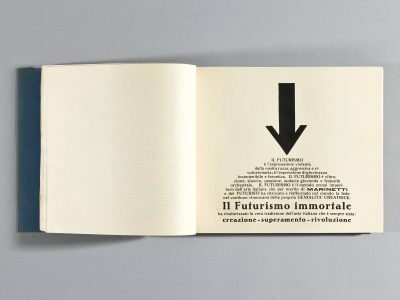 Text about the Depero Futurist House of Art by F. T. Marinetti (in French). 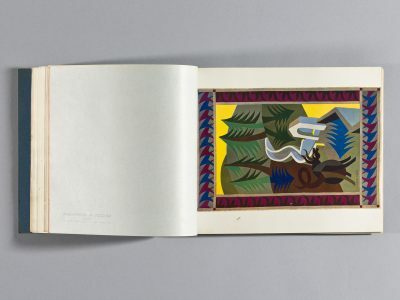 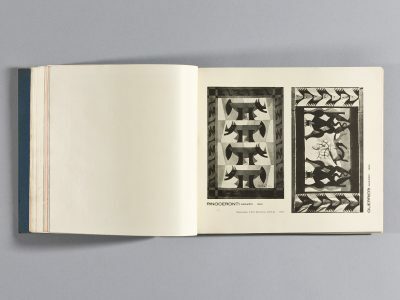 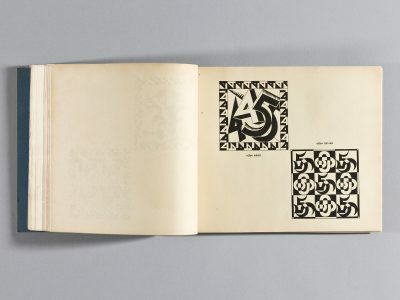 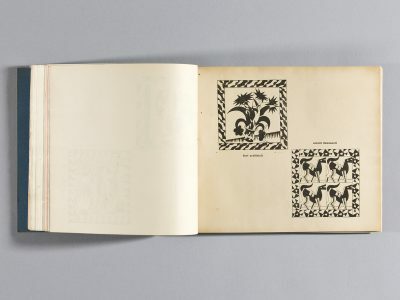 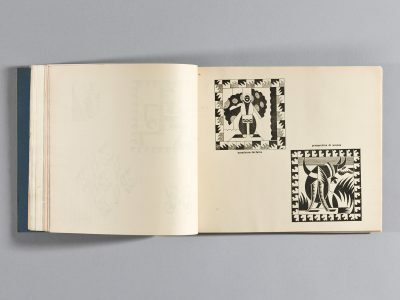 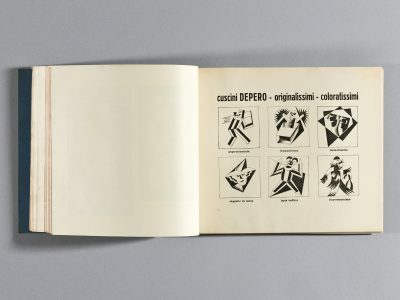 The text on the page on the right says: “The very original Depero’s pillows and tapestries.” The red text at the bottom page 152 says: “Long live Depero” with Depero’s name spelled backward and positioned upside down. 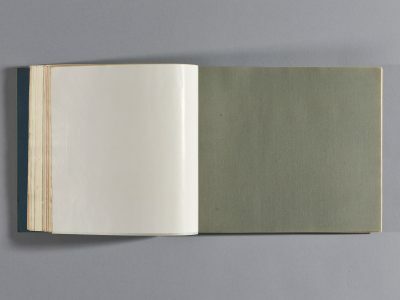 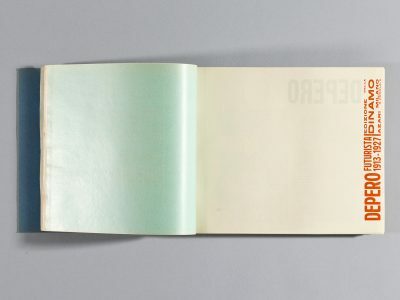 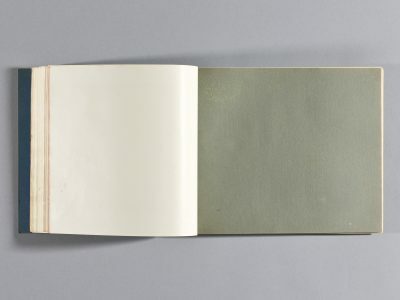 The painting on page 155 is visible through the tissue paper on the right side of the spread. 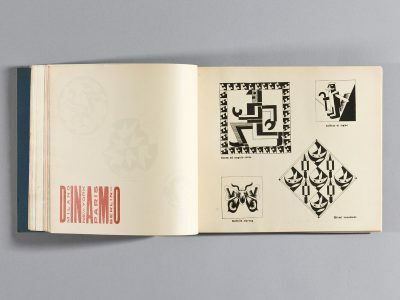 Four logos designed to advertise Depero’s Futurist House of Art. 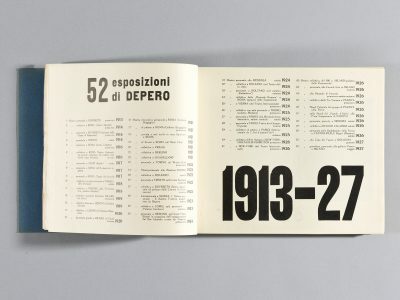 Exhibited at the 1926 Venice Biennale, this was a controversial operation that included an advertisement in a fine arts context. 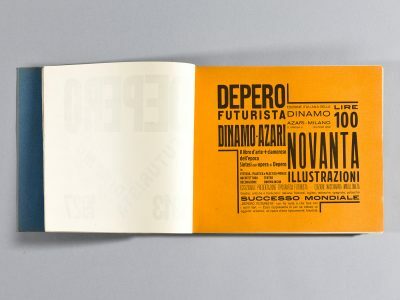 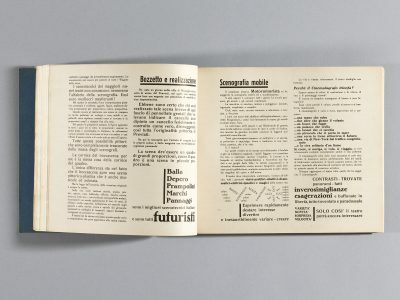 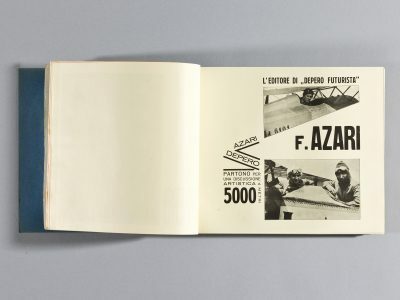 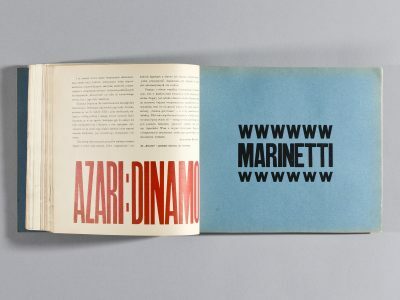 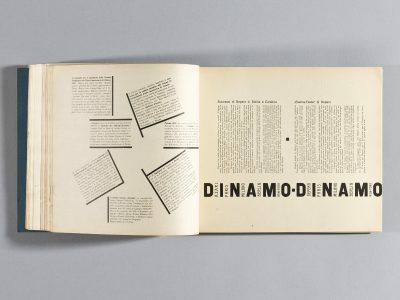 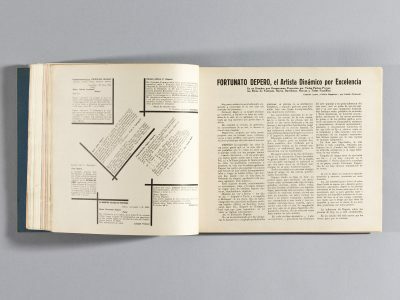 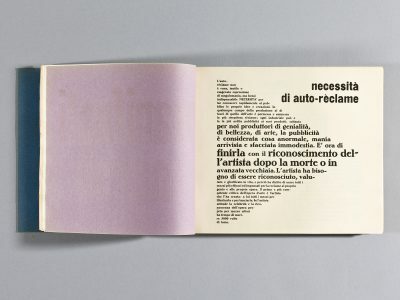 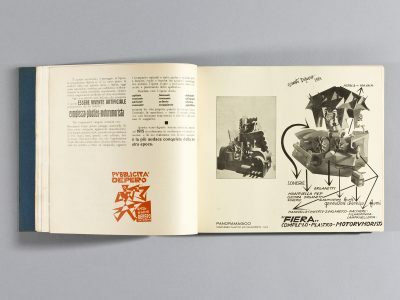 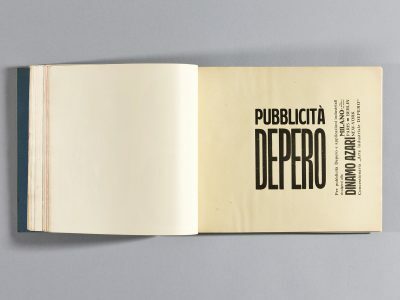 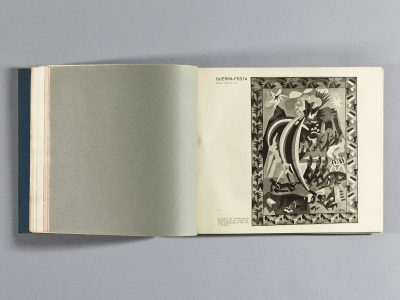 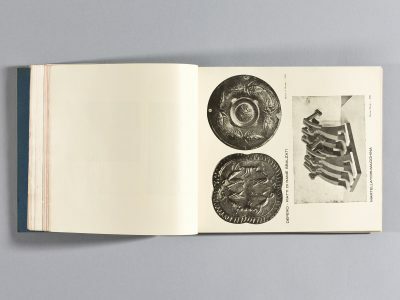 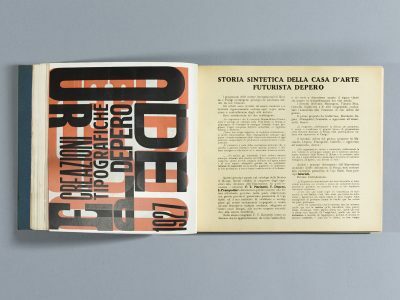 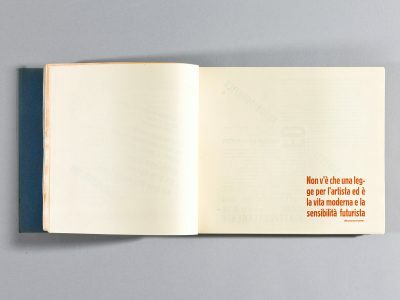 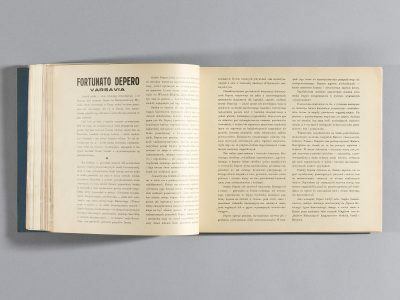 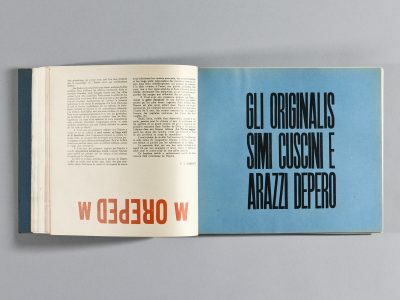 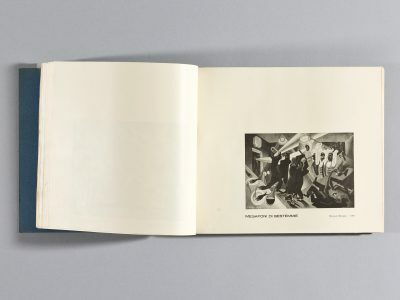 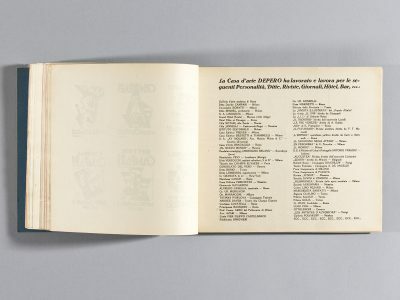 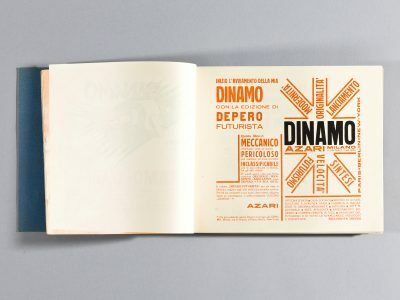 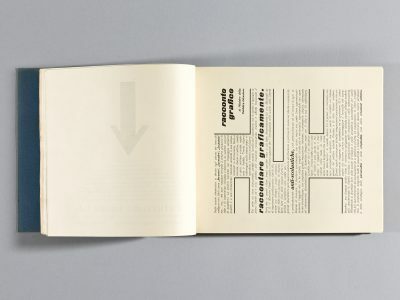 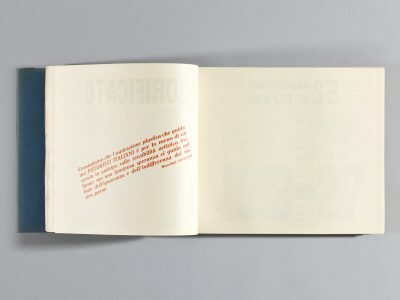 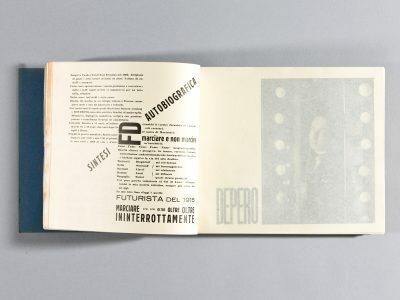 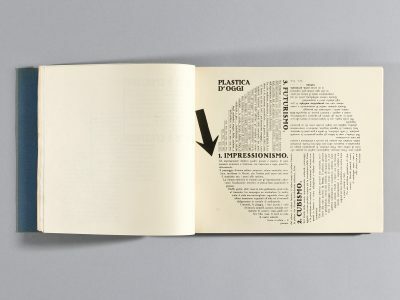 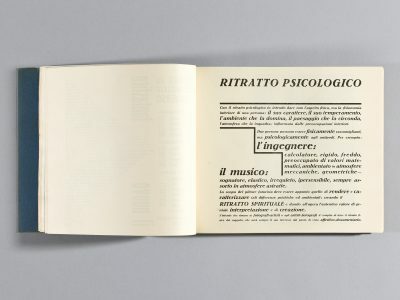 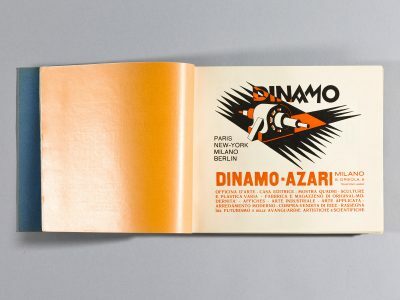 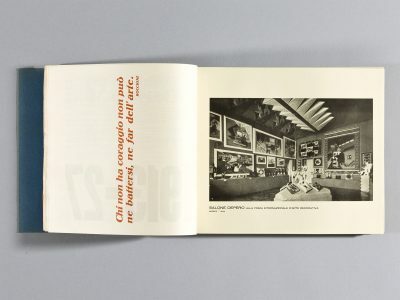 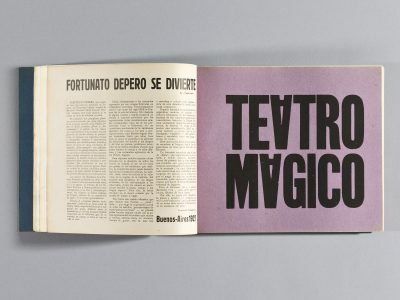 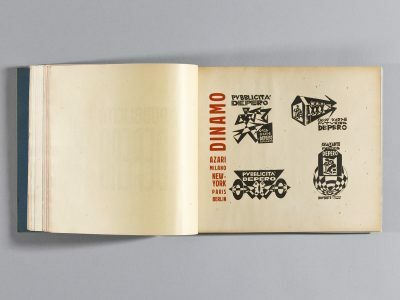 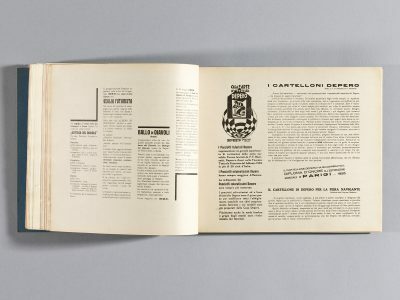 The page on the right features advertisements for four companies that contributed to the publication of Depero Futurista. 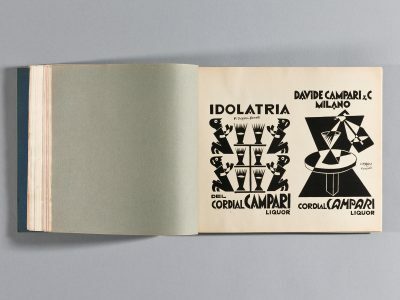 G. Bologna & C. is referred to as the “bolts factory” and Tensi corporation as the “paper factory.” G. Monzani and C. is called the “photo-mechanical workshop” and Davide Campari-Milano, the parent company of Campari, is also acknowledged. 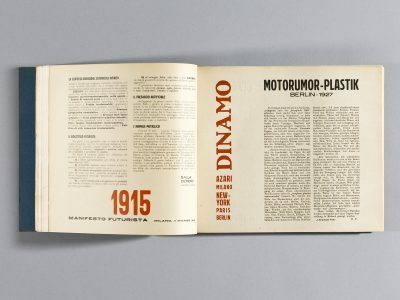 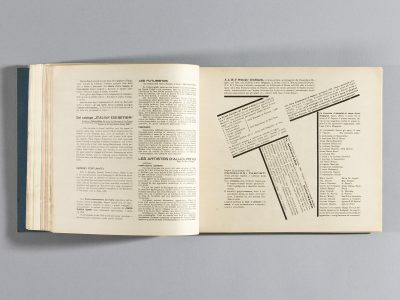 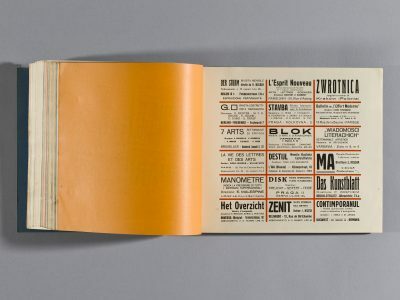 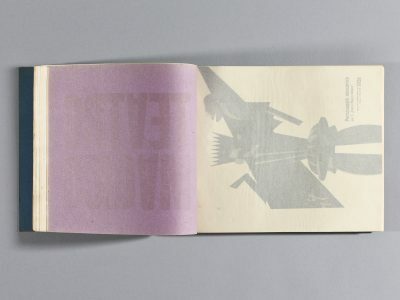 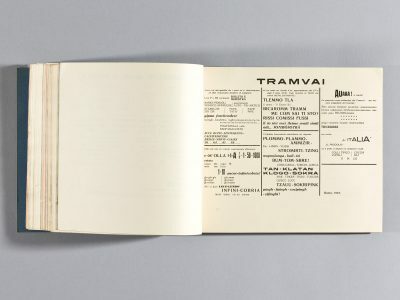 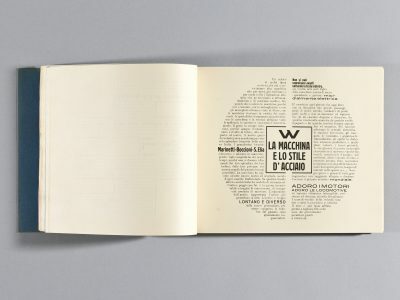 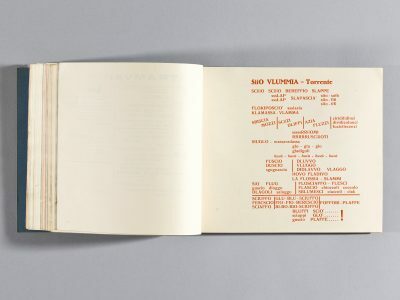 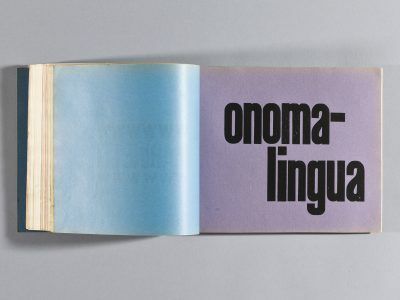 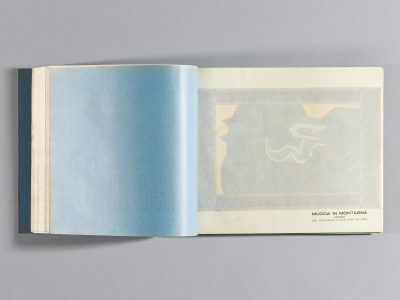 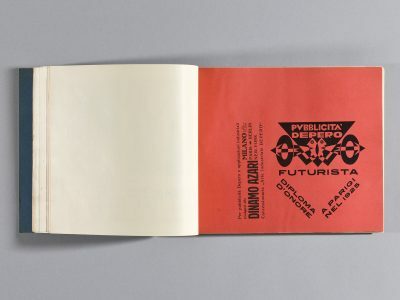 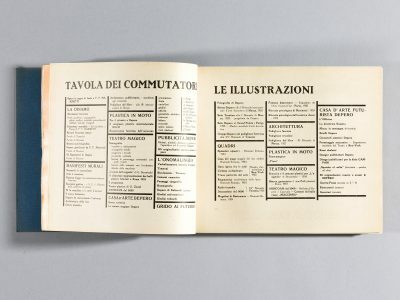 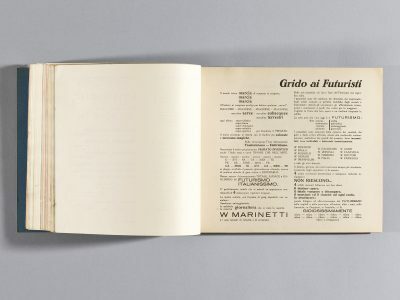 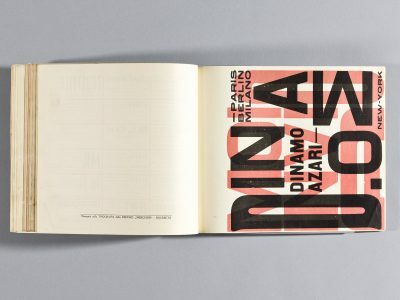 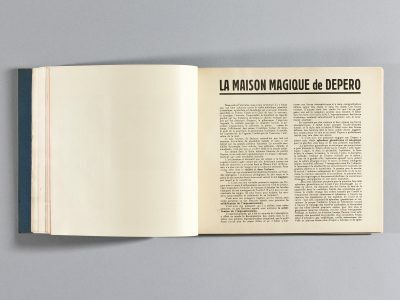 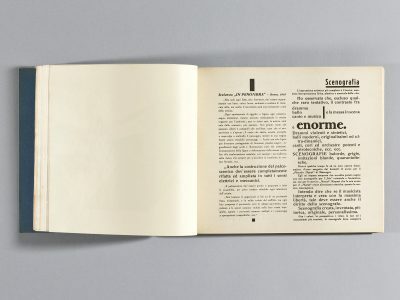 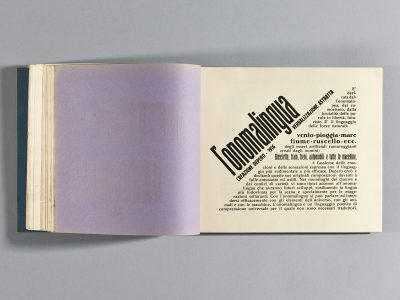 The grid of boxes on this page features the names and addresses of European Futurist magazines set in a variety of typefaces used throughout the book.